Question Mark Business PowerPoint Templates And PowerPoint Themes 1012-Create stunning Microsoft office PPT Presentations with our professional templates containing a graphic of blue question mark with ladder. This image also contains business silhouette standing near question mark. It portrays the concept of confusion, solution and uncertainity. This image has been professionally designed to emphasize the concept of brainstorming. This image has been conceived to enable you to emphatically communicate your ideas in your Business and Marketing PPT presentations. Our PPT images are so ideally designed that it reveals the very basis of our PPT template are an effective tool to make your clients understand.-Question Mark Business PowerPoint Templates And PowerPoint Themes 1012-This PowerPoint template can be used for presentations relating to-"Human and blue question mark, business, communication, design, people, signs" Bring it to a boil with our Question Mark Business PowerPoint Templates And PowerPoint Themes 1012. Get your audience bubbling with energy. 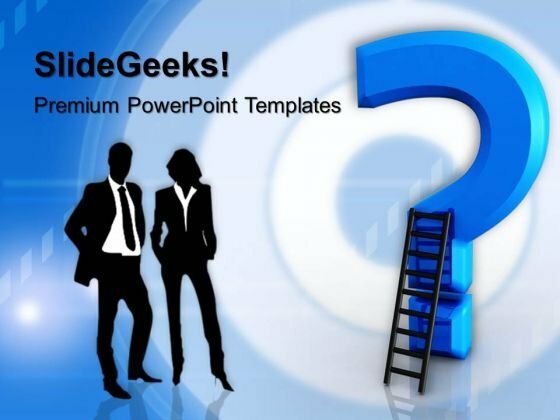 Fulfill aspirations with our Question Mark Business PowerPoint Templates And PowerPoint Themes 1012. Cater to all your clients fancy demands.